The ultimate in club effect lighting just got better! No other luminaire in the industry can match the magic of the Martin WizardExtreme and now with the Martin WizardExtreme, stunningly brilliant reflection and wild gobo patterns have been added to push out every ounce of power! • Shutter for fast strobing. Screaming new reflector captures and throws out the total power of the Martin WizardExtreme deep into every corner of the night. With at least 20% more reflection the Martin WizardExtreme is unmatched in its shinning performance. Improved focus control allows you to home in on the exact image you need to relay. Designed for minimal maintenance, the Wizard Extreme houses a high-output 250-watt discharge lamp with a 2000-hour life that guarantees long-lasting performance. A special optional multi-coupler is available to create the meanest centrepiece giving your space a total light and effect bombardment. Pumping new gobo designs keeps the Martin WizardExtreme planted firmly in the 21st century scene! 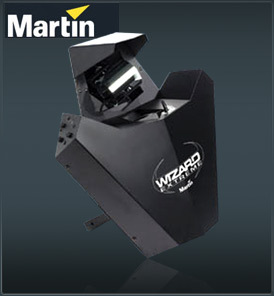 Flexing both midair and projection effects, the Wizard Extreme covers every angle of the show like no other. Broadening the Wizard's extraordinary ease of use, the new Martin WizardExtreme has effortless lamp adjustment located externally, so you need no other tools than the ones you’re born with! The Martin WizardExtreme is powerful enough to fill the largest venues with a dazzling display of effects. A constant swarm of more than 80 color gobo beams creates the biggest explosion of color and light. There’s nothing black about this magic. The Martin WizardExtreme offers the best of both worlds: Extreme agility and unprecedented power. The Martin WizardExtreme is so versatile it can be used in any setting. Clubs, touring events, TV studios and mobile DJs.